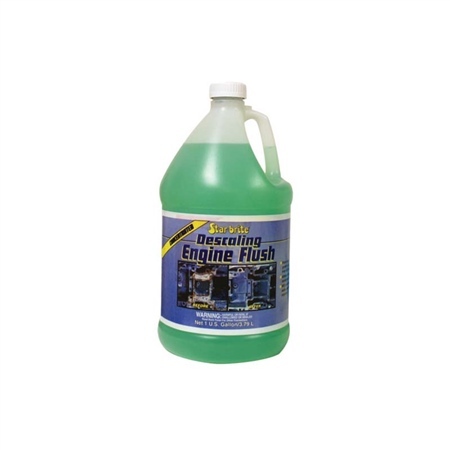 Star brite Descaling Engine Flush is designed to safely and quickly remove scale, calcium deposits, corrosion, salt and carbon buildup in your engine’s cooling and wet exhaust systems. These deposits can make your engine run hot by restricting water flow through the cooling jackets. Calcium buildup also may damage your engine’s water pump. Descaling Engine Flush WILL NOT damage seals, gaskets or rubber impellers. Read all instructions and cautions completely before using. Will not damage engine seals, gaskets or rubber impellers. WARNING: Contains inhibited and enhanced Hydrochloric Acid. Use in well-ventilated area. Harmful if swallowed. If swallowed, drink 3-4 glasses of milk, milk-of-magnesia or water. DO NOT induce vomiting. Call a physician immediately. If contact with eyes occurs, flush eyes continuously with fresh water for 15 minutes. Get medical attention if irritation continues.